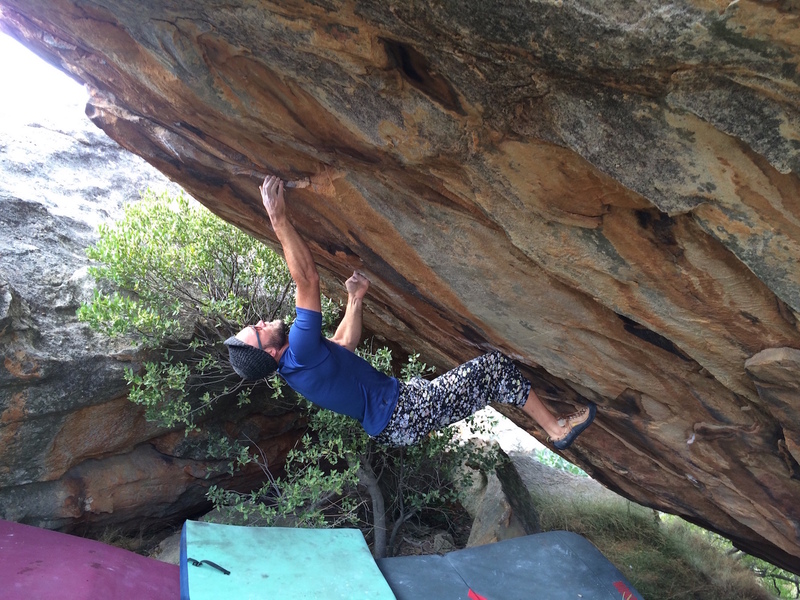 In May 2015 I was in South Africa for 10 days to visit family, friends and to climb. Back then my friend Unio Joubert was in a wheelchair. This was after reconstructive surgery to both his ankles. At the end of 2014 Unio fell ~5m, barefoot onto coastal rocks in Oman - he had been standing on a ledge, exploring for potential routes when a hold broke. He suffered open breaks on both ankles. 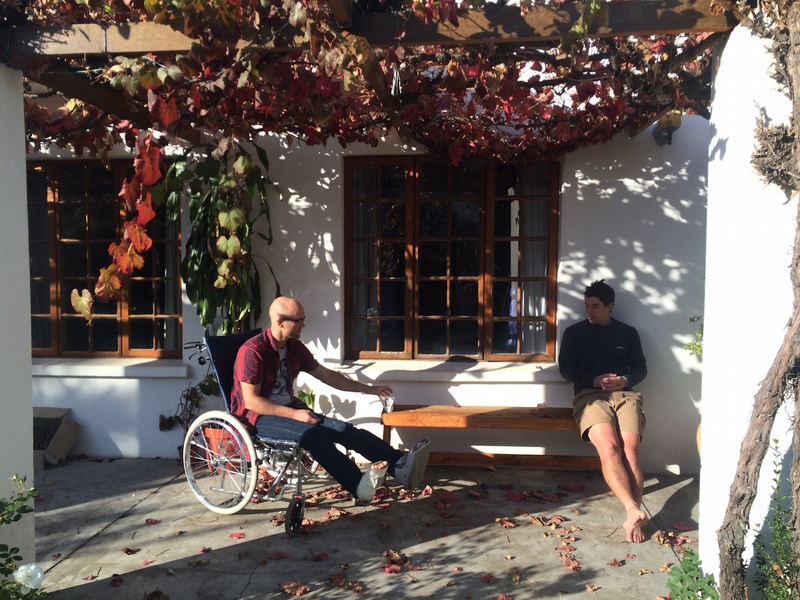 In May 2015, 6 months after the accident, he was back in South Africa working towards recovery. I remember nervously yet enthusiatically talking to him about how we would climb together in the future again, uncertain about how realistic that was. Just before the accident we had been in Magic Wood, having a great time and more plans were already in the pipeline. All of this and more would have to be put on hold now. Unio's fighting spirit was visible nonetheless: we wheeled his chair as far into the boulders as possible so he could hang out with us while we climbed. When I returned for another climbing trip in July 2015 he had already made huge progress. Armed with crutches and a boot Unio was hanging out with us among the boulders - those that had the shortest walk-in. His progression continued and when I saw him again in South Africa in October 2015 he was walking short distances without crutches. All the while Unio was of course doing hangboard sessions with his brother Jurie, and doing yoga almost every morning. In parallel to progressing with walking Unio had his sights set on progressing with climbing :) When I visited again this May, the extent of his progression was simply astonishing. The morning after I landed we went climbing at a new area. This time Unio was walking with us, armed with walking sticks, and he was bringing his climbing shoes. 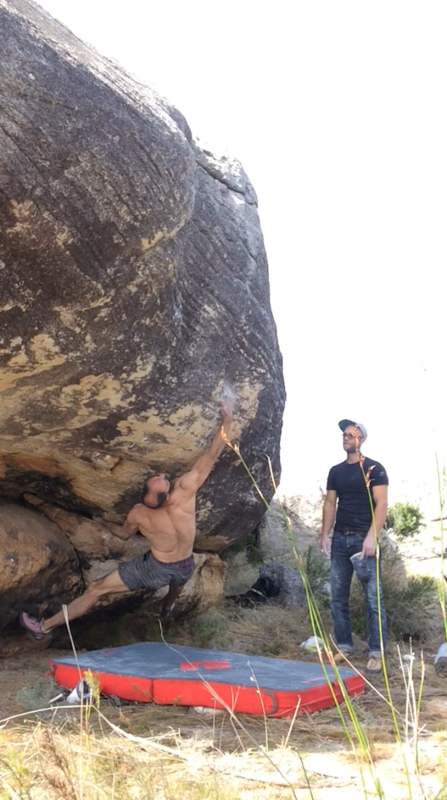 We warmed up, Unio sticking to some low-balls, did some easier FAs (First Ascents) and moved on towards a beautiful problem recently opened by Jeanrich: Kapokhaantjie, a 40 degree overhanging 7b on black and gray compact sandstone with a perfect base, in a cave that never gets sun. Ten minutes into the session Unio was cruising the crux and falling at the top - mostly being nervous about the height. Now that is progression: a year ago he was in a wheelchair and now he was about to send a 7b boulder. Simply incredible. I was in awe. Slowly but surely I started believing my eyes. We were climbing with Unio again. Later that week he established a new 7a roof problem - with ease. While driving towards the boulders we talked about the recovery process, motivation and methods for progression (with walking again). It's wonderful that climbing, as a source of inspiration for physical action, can be both a motivator and a method for recovering from such a life-changing accident. 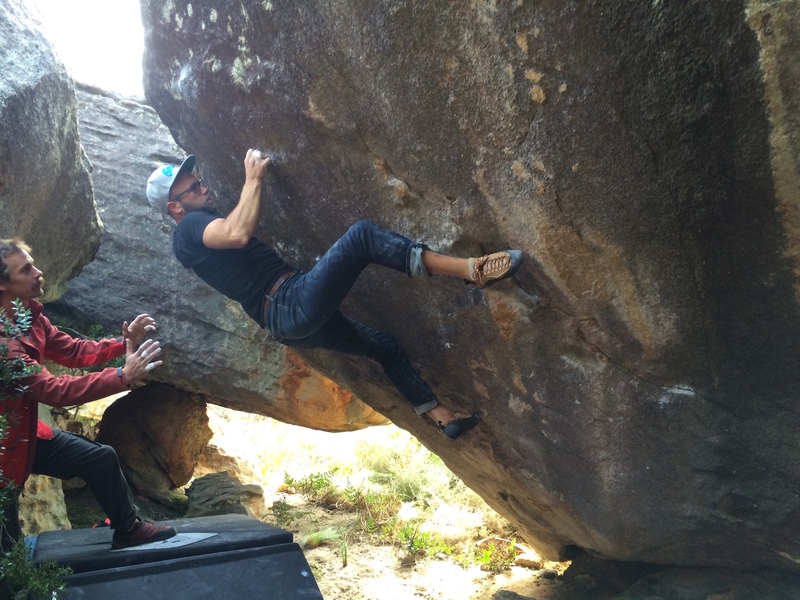 The week of climbing was filled with great new boulders and good times. 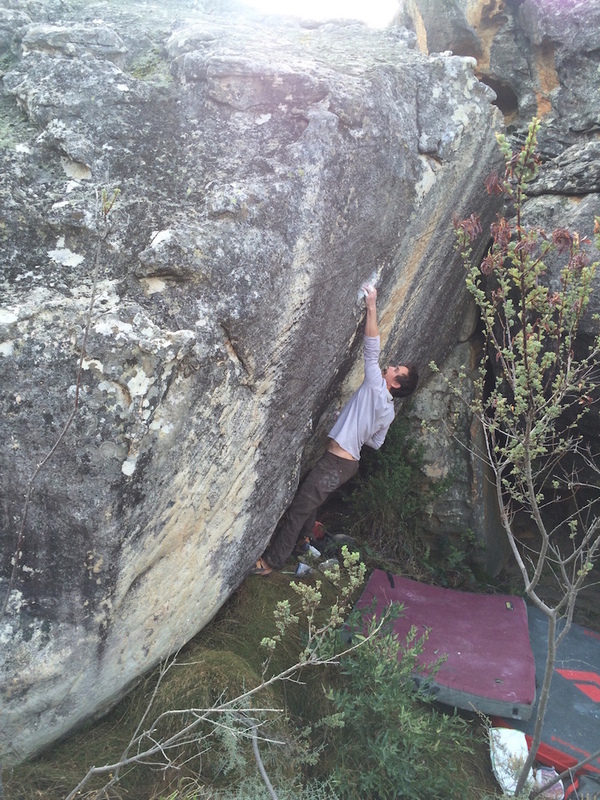 We did a cool prow, White Monopoly Capital, 6c. It starts with a weird traverse on slopers, goes into steep positive climbing and ends with a great slopey topout sequence. Here's Chris enjoying the moves. And a 2-move 7a+ called Afgunspolitiek. Pure as. Jurie getting ready to stretch. Another highlight for me was doing Die Kameelperd. This is a one-move slab dyno. One big committing move that requires full-body coordination. 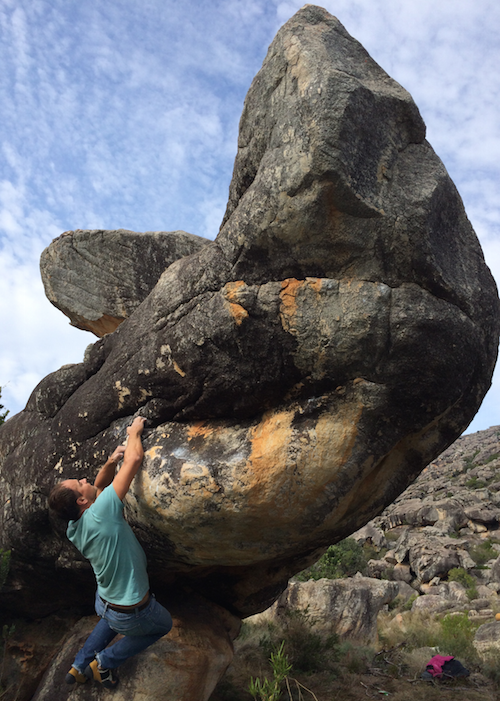 Boulders like this are impossible to grade accurately but let's just call it a 7a+, hard enough to make you think twice. I had tried it once maybe 5 years ago and it was great coming back to finish it. 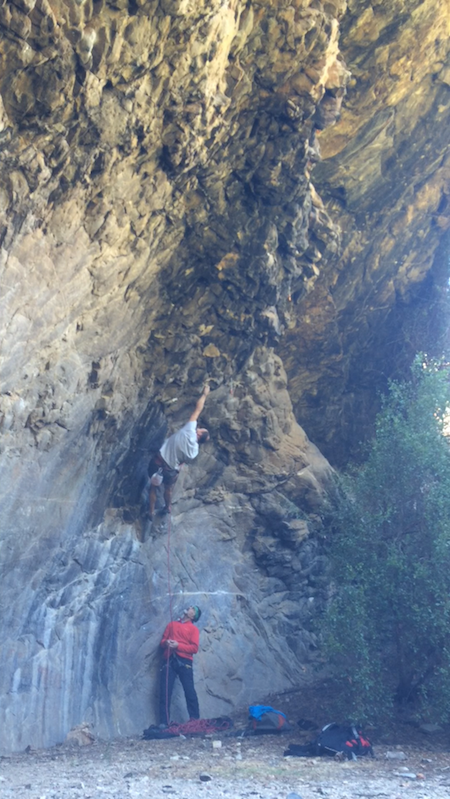 Yet another route I had tried about 5 years ago was Shad, a bouldery 8a+ sport route with a 4-move crux. 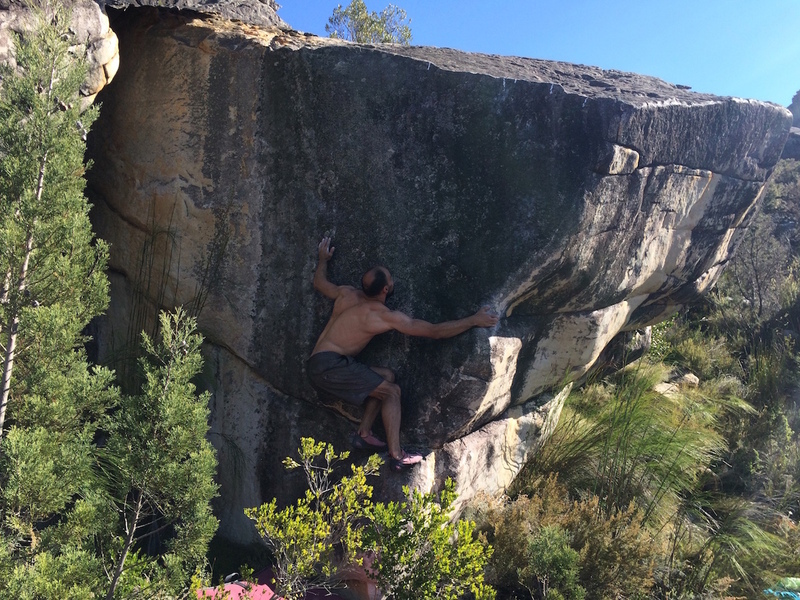 I went to Montagu for the day with my dad and sent the route on my 2nd attempt. It was good to feel progression in my own climbing: before I could only just manage the crux whereas this time there was no way I was coming off. My own modest progression, however, had been put into perspective when I thought about how Unio had gone from his wheelchair to 7b in one year. New ideas for sharing climbing missions with Unio are coming to mind every day. The dreams that had to be put on hold are making their return. Up and atom!